For the last two years hubby and I have been changing things up all around the house. Like the half bath, adding a striped feature wall, getting the most out of our spare room and creating a haven for our little O. But to be honest, not much attention has been paid to our master bedroom. Except for painting it and refinishing some killer second hand furniture (read about them here and here), we really haven’t done much. In fact, the master is pretty drab looking. 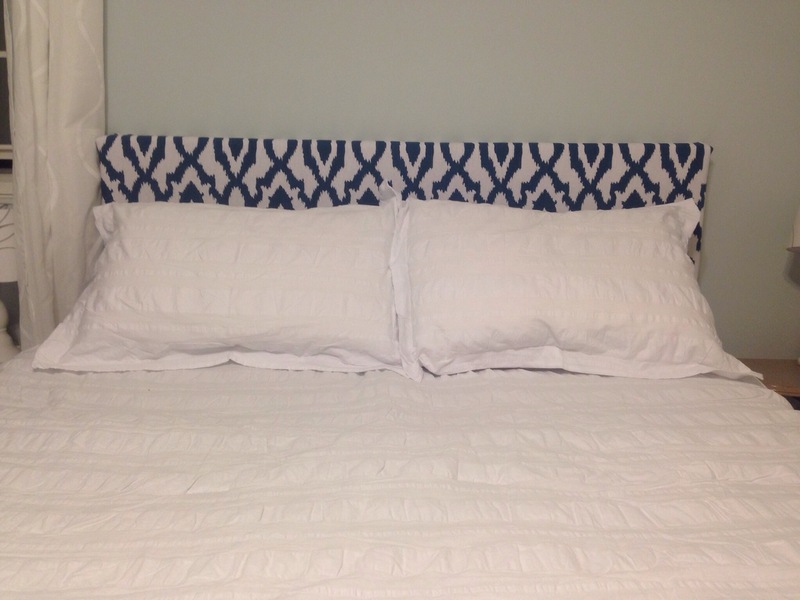 We just agreed on a bedspread for the first time in seven years and the only way I really sold him on the ruffle effect is that it was striped (sort of) and majorly on sale at Target. The white really pops in the soft blue room and it brings a little brightness in with our white curtains. The main problem is that it was leaning against our sad tan headboard. 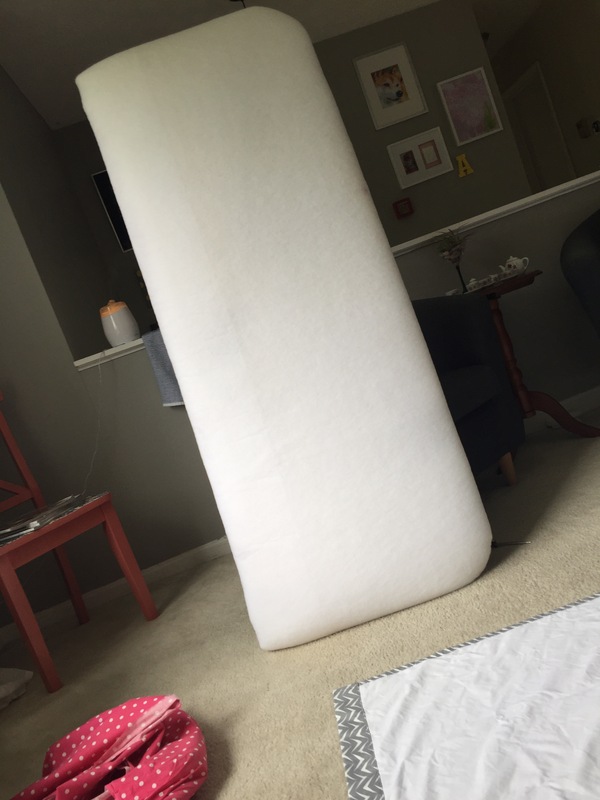 Whomp whomp… and the headboard was bringing the whole thing down. 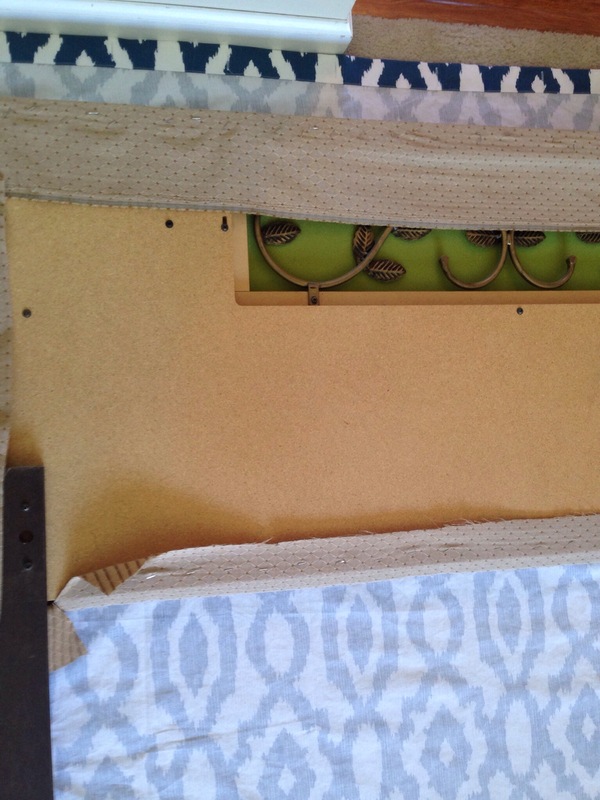 Originally the headboard was wooden with some metal vine detailing and matched a set that Hubby had once upon a time. I recovered it years ago in an effort to freshen it up but once again it is looking more drab than fab. Have a look-see. For quite a while I have been badgering Hubby to come with me to the fabric store and choose something so I can recover the headboard. I was banned from independent fabric purchasing trips after I bought “Dr. Seuss” fabric as a potential option for the headboard way back when. I also knew that I couldn’t buy several options, bring them home to choose and then return anything he didn’t like. After begging for him to join me on a fabric store field trip for the last six months I finally decided I was on my own. 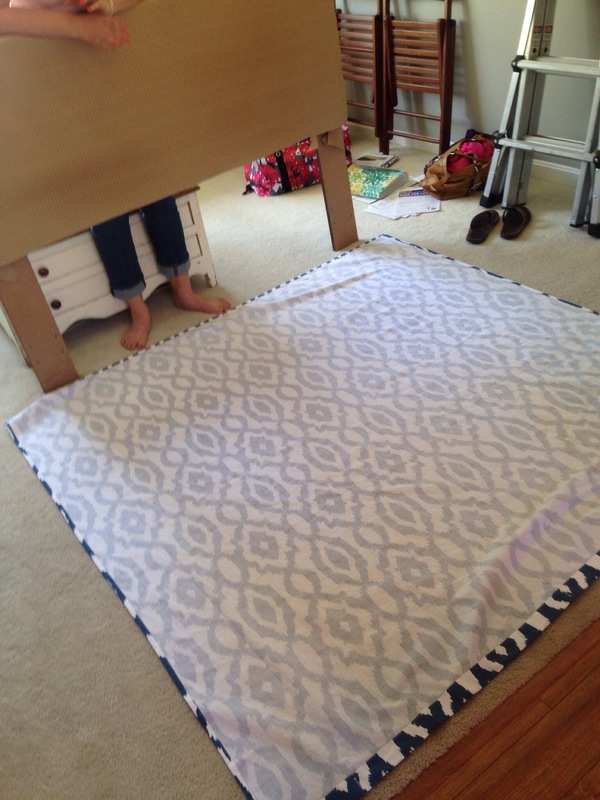 After being discouraged by the prices of upholstery fabric I felt like there was no hope. This couldn’t be a $200 project. 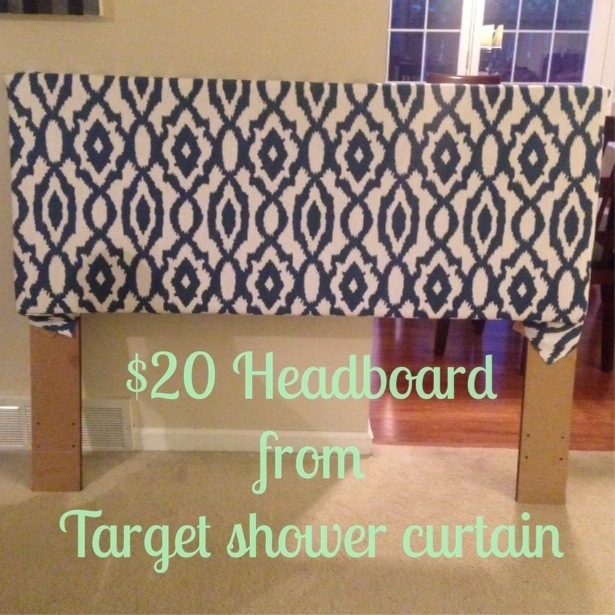 On my last few trips to Target I had been eyeing some great Ikat, geometric, medallion and lattice style curtains and shower curtains. I so badly wished we needed curtains somewhere in the house because the patterns were so gorgeous. Boom! It hit me. 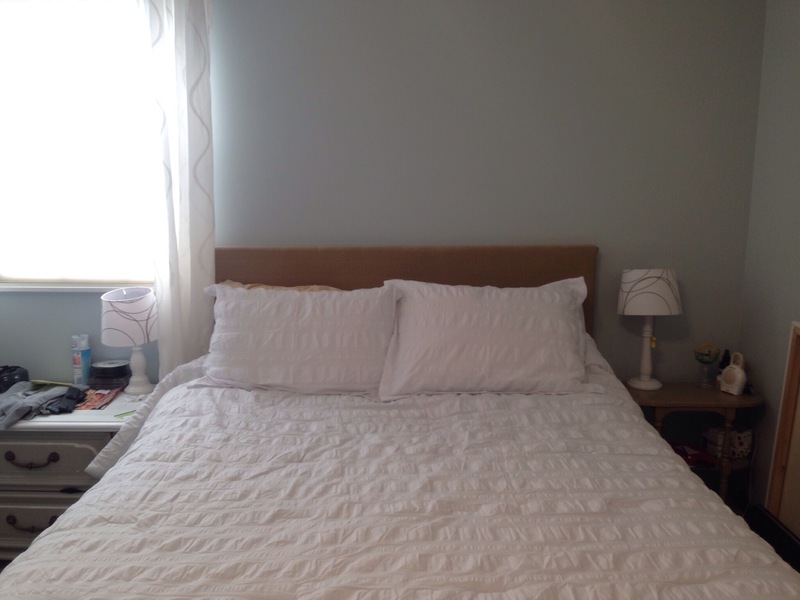 I bet I could use a curtain panel or shower curtain to recover the headboard. I enlisted Molly to help me choose one on the next Target run. She often brings me down to reality after I’ve spent an imaginary fortune on a risky design decision in my head. 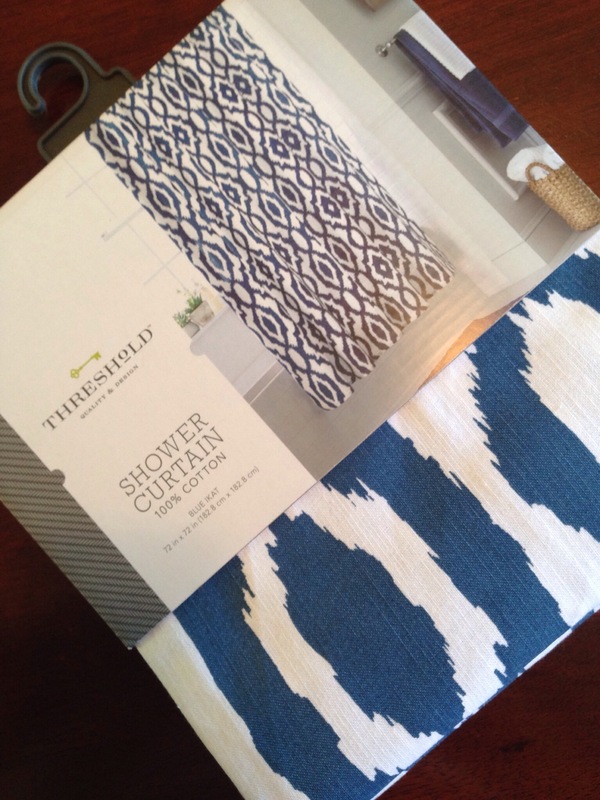 We chose thie blue Ikat lattice patterned shower curtain from the Threshold collection. The idea was that blue was masculine enough, the lattice as bold but still classic and the Ikat flare was cool. And it wasn’t floral (Hubby’s big deal breaker).We took a risk and hoped the royal blue wouldn’t totally kill the soft Glass Slipper (Benjamin Moore) blue walls. 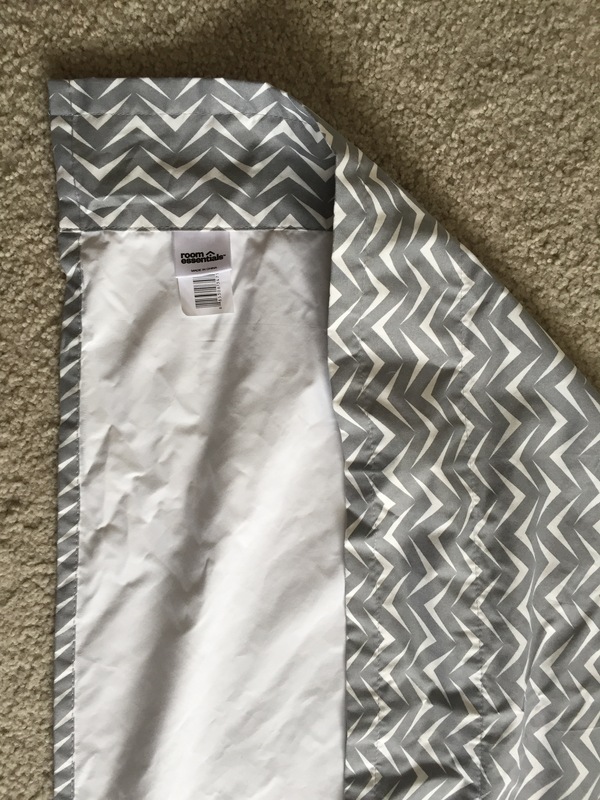 The shower curtain measurements were wide enough that we could use the pattern vertically (as if it were hanging as it was designed to) on my queen sized headboard. 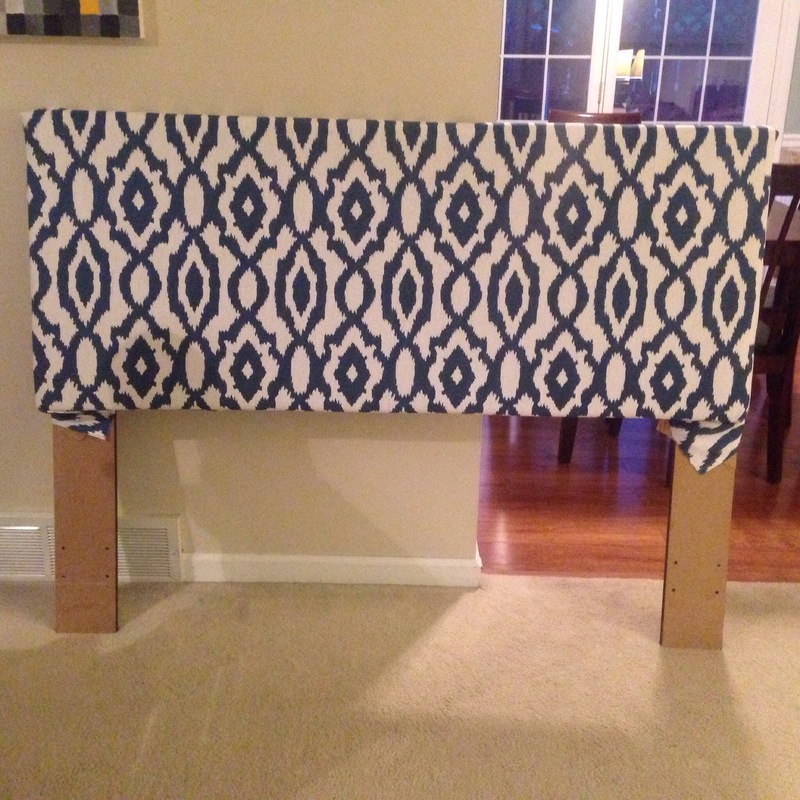 For a king I would recommend using a pattern you might like oriented horizontally so that the fabric can fit the width of the headboard. 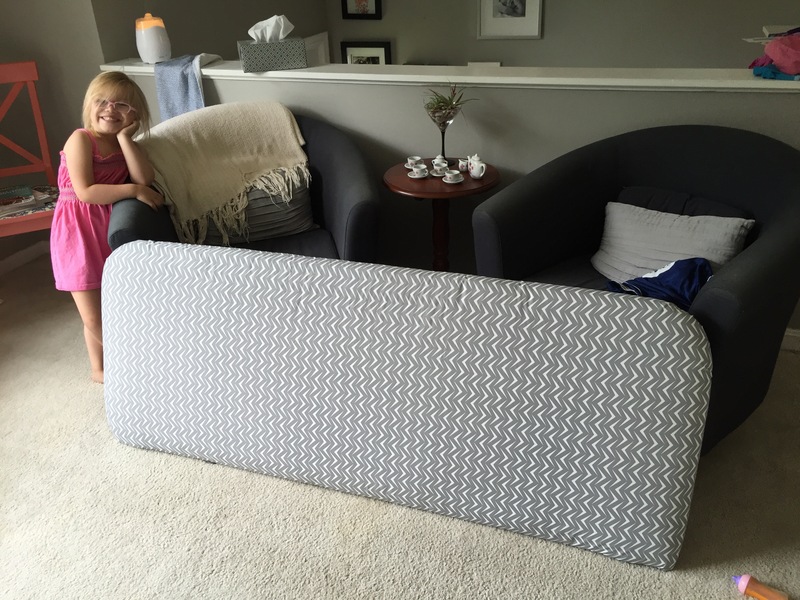 We hauled the headboard out of the master and set up shop in the family room. 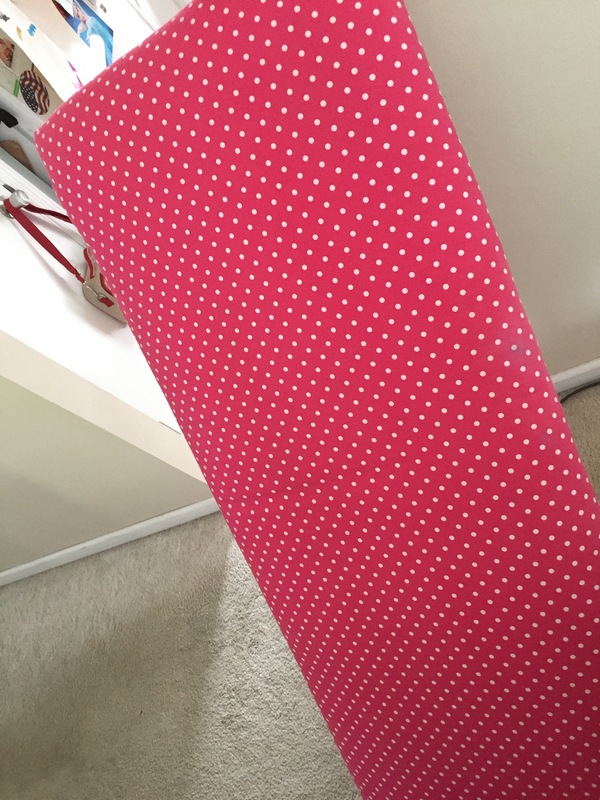 I wrinkle released and fluffed the curtain so that all the fold marks from being packed were gone. No, I don’t iron. Don’t get me started. In the photo below you can see the detail of the back of the original headboard design and the foam underneath that I had used to transform it the first time.We lined up the hem seam with the top edge of the board (below) so that the pattern would stay level and we wouldn’t risk having it slope in one direction after the staple-fest I was about the have. If it was a more random style print or a solid this wouldn’t really be a concern. 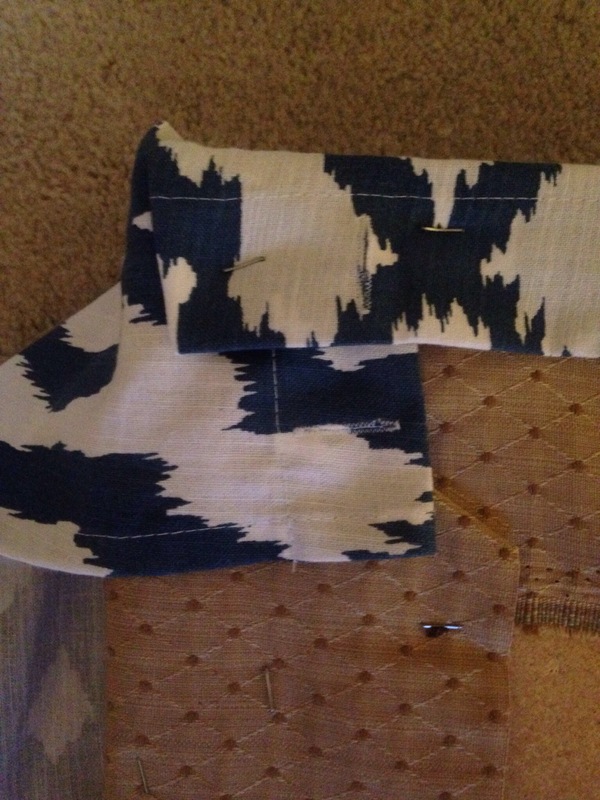 Then the fabric was cut to size which was pretty much in half in this case. 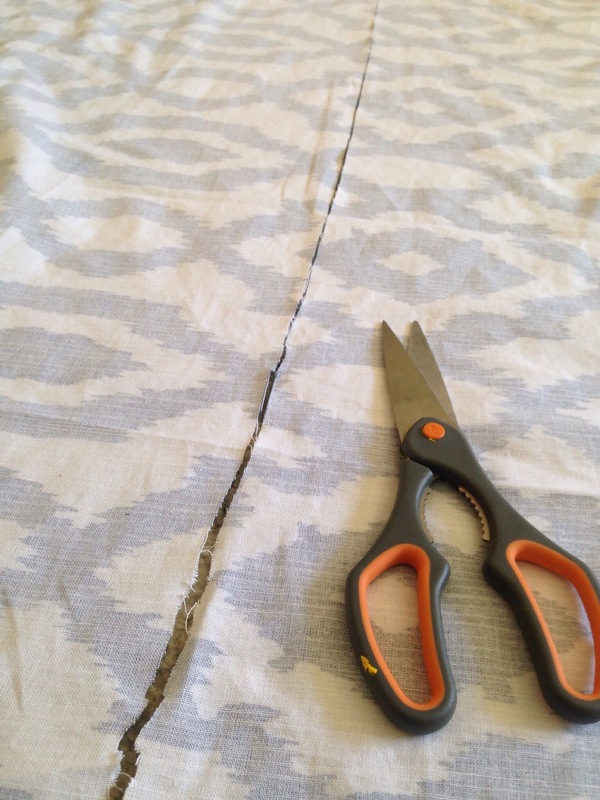 I took into consideration that we would rather have more fabric to staple than not enough. Stapling started across the top which was pretty easy and self-explanatory. 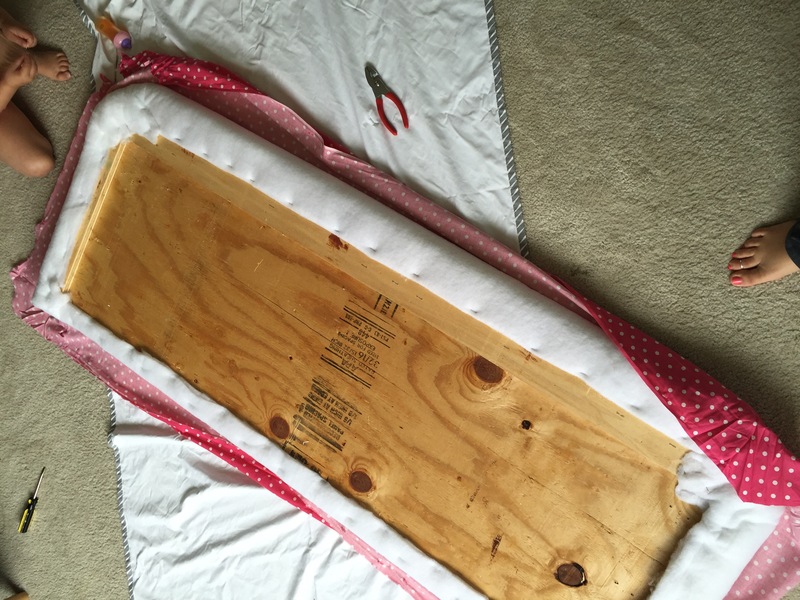 I used a “gift wrap method” as shown below for the corners and trimmed out any excess fabric that gave the corner to much bulk because that would be too much to staple through and may look chunky from the other side. Less than 15 minutes later I was ooh-ing and ahh-ing at this bad boy. I think this may be the best $20 I ever spent. Ta-da! Hubby returned home from an all day soccer tournament to see this glorious masterpiece. At first he was a little taken by the boldness and was surprised (since I had promised not to visit a fabric store). A day later he was telling me how much he liked it and the it was growing on him. I think it looks crisp and definitely more expensive than it is. Victory!